Today’s A p p s Gone Free: Toppling Towers: Halloween, Gibbets 2, Forever Lost: Episode 1 And More. Fire arrows through the air to save the hanging people before they run out of breath in HeroCraft’s physics-based game, Gibbets 2. We also have a physics-based game from Big Fish Games that has you toppling towers, and a point and click adventure game. Military Time Converter ($0.99 → Free, 6.4 MB): This super simple utility app is intended for those who have trouble reading and understanding military time. Spin dials at the bottom of the screen to choose the military time, and at the top of the screen you’ll see the time conversion. The app also includes a complete military time zone guide. Military Time Converter is available for free for a limited time. It has a 4.5-star rating with a total of 12 ratings. Monster Warrior ($0.99 → Free, 26.4 MB): Save the escaped bunnies from the wicked witch by disposing of her monster minions in this arcade game. Monsters enter the screen from the bottom, and you must swipe your finger across them to slash them to bits before they escape. Try to string together combos to earn more points. Just be careful not to take out the cute bunnies! The game includes four modes, and achievements and leaderboards via Game Center. Monster Warrior is available for free for a limited time. It has a 4.5-star rating with a total of 20 ratings. Steamscope ($0.99 → Free, 149.5 MB): A tube-racing game that requires a steady hand and quick reflexes. As you speed down the tubes you’re required to dodge all kinds of obstacles while not bumping into the walls. You can also utilize your tesla gun at just the right moment to overcome seemingly impossible obstacles. The game includes a variety of levels, and two control options. Steamscope is available for free for a limited time. It has a 4-star rating with a total of 20 ratings. Pumpkin Sweet Adventure ($0.99 → Free, 19.2 MB): Play as a witch in training and collect as much sweet, sweet candy as possible before time expires in this arcade game. You’re able to control your character’s movements by tilting your iDevice. Fill the meter at the bottom of the screen to go into bonus mode and earn even more points. The game includes five worlds, five power-ups, four costumes, and leaderboards via Game Center. Pumpkin Sweet Adventure is available for free for a limited time. It has a 4-star rating with a total of 16 ratings. Secrets Folder Pro (Lock your sensitive data) ($0.99 → Free, 5.1 MB): Keep your sensitive data away from prying eyes with this utility app. You’re able to import and organize photos, create searchable notes, import contacts, create voice memos, store account information, and browse web pages. All of this can be hidden behind a simple passcode lock, or you can create a complex passcode or dot pattern. Secrets Folder Pro (Lock your sensitive data) is available for free for a limited time. It has a 4.5-star rating with a total of 25 ratings. Toppling Towers: Halloween ($1.99 → Free, 65.7 MB): Help the princess win her kingdom back from the Pumpkin King by toppling towers in this physics-based puzzle game. Pull back on the slingshot to align and set your shot, and then release to take out portions of each castle. As you progress through the game, you’ll come across new runes, which allow you to smash castles in new ways. The game includes two modes, five worlds, and achievements and leaderboards via Game Center. Toppling Towers: Halloween is available for free today only (10/31). It has a 4.5-star rating with a total of 401 ratings. Forever Lost: Episode 1 HD ($0.99 → Free, 308.8 MB): A point and click adventure game that has you trying to discover who you are, where you are, and how to escape. Piece together the puzzle of your life by following the clues scattered around the 3D environments. Collect items, scribble notes, and snap photos to work your way out of the haunted nightmare. The game also includes an eerie soundtrack, and a full hint guide so you’ll never be stuck for too long. Forever Lost: Episode 1 HD is available for free today only (10/31). It has a 4.5-star rating with a total of 74 ratings. Zombie Toss ($0.99 → Free, 37.7 MB): Turn ghoulish creatures into delicious meals in this arcade game. Grab your meat cleaver and chop zombies into bits as they enter the screen. String together combos while avoiding barrels of toxic waste to earn big points. As you progress through the game, you’ll have the opportunity to unlock new and more powerful weapons. The game includes four chapter, 30 levels, and loads of zombie types. Zombie Toss is available for free today only (10/31). It has a 5-star rating with a total of 44 ratings. Gibbets 2 ($0.99 → Free, 28.8 MB): Save the hanging people before they run out of breath by cutting their ropes with your arrows in this physics puzzler. Tap and drag your finger backwards to draw your bow, and when the angle looks just right, release to fire your arrow. Try to use as few arrows as possible and avoid hitting the hanging people with your arrows to earn a high score. The game includes 50 levels, power-ups, and achievements and leaderboards via Game Center. Gibbets 2 is available for free today only (10/31). It has a 4-star rating with a total of 33 ratings. Zombie Area! ($1.99 → Free, 32.6 MB): Blast zombies to bits in this tap-shooter. Zombies of different shapes and sizes come rushing at you on foot and through the air. Just tap in their general direction to unleash a barrage of bullets. Try to survive for as long as possible to climb the leaderboards. The game includes three environments, unlockable tunes, and achievements and leaderboards via Game Center. Zombie Area! is available for free today only (10/31). It has a 4.5-star rating with a total of 57 ratings. Monster Warrior HD ($1.99 → Free, 28.9 MB): Save the escaped bunnies from the wicked witch by disposing of her monster minions in this arcade game. Monsters enter the screen from the bottom, and you must swipe your finger across them to slash them to bits before they escape. Try to string together combos to earn more points. Just be careful not to take out the cute bunnies! The game includes four modes, and achievements and leaderboards via Game Center. Monster Warrior HD is available for free for a limited time. It has a 4.5-star rating with a total of 12 ratings. MyBrushes Pro – Paint, Draw, Scribble, Sketch, Doodle on Unlimited Size Canvas ($1.99 → Free, 54.6 MB): Let your creative side run wild with this drawing and painting app. You’re provided with 100 different brushes to choose from, each of which can be customized in a variety of ways. The app also includes an unlimited canvas, undo and redo, the ability to import images from your library, 50 background templates, and the ability to share your creations via Facebook, Twitter, or email. MyBrushes Pro – Paint, Draw, Scribble, Sketch, Doodle on Unlimited Size Canvas is available for free for a limited time. It has a 4.5-star rating with a total of 8 ratings. Steamscope HD ($1.99 → Free, 215.2 MB): A tube-racing game that requires a steady hand and quick reflexes. As you speed down the tubes you’re required to dodge all kinds of obstacles while not bumping into the walls. You can also utilize your tesla gun at just the right moment to overcome seemingly impossible obstacles. The game includes a variety of levels, and two control options. Steamscope HD is available for free for a limited time. It has a 4-star rating with a total of 25 ratings. Burglar Accidentally Films Robbing Houses With His iPhone. Really?! Burglars, it seems, get dumb, dumb, and dumber, especially when it comes to Apple devices. The Daily Mail reports that a burglar managed to record himself in the act with his iPhone which later proved to be the incriminating evidence against him. All he wanted to do was to use his phone as a flashlight. Why even bother with CCTV if you get burglars as stupid as this? Even worse was that he didn’t even think to check his recorded videos to see if anything had accidentally been recorded. BUSTED! Need For Speed: Most Wanted races onto iOS today. There are plenty of racing games available for iOS on the App Store, but few carry the name recognition of Need For Speed. Today, Electronic Arts released its latest game in the popular series, Need For Speed: Most Wanted (US$6.99, universal). Its arrival coincides with the console versions of the title, but this mobile version loses surprisingly little in translation. It has all the fit and polish of its larger-budget counterpart, no doubt thanks to the involvement of developer Firemonkeys, a team comprised of talent responsible for Firemint’s exceptional Real Racing series on iOS. Unauthorized Lightning Accessories with New Docks. 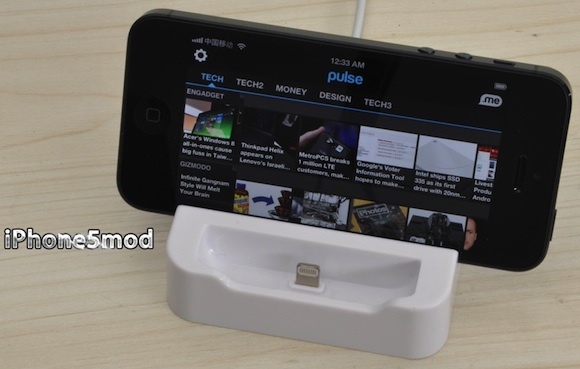 Over the past few weeks, we’ve been covering a few of the recent unofficial Lightning accessories that have been surfacing into the void left by Apple’s decision to wait unliterary November to begin bringing most of its official accessory partners up to speed on the new connector for the iPhone 5, iPad, and iPad mini. iPhone5mod seems to be one of the fastest-moving companies releasing Lightning accessories without Apple’s authorization, having released several cables and working on docks and adapters using the new standard. 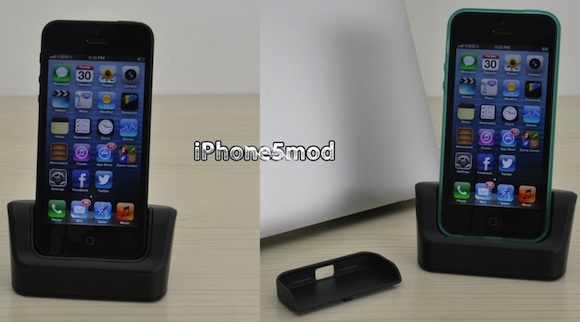 The company today announced two new Lightning docks for the iPhone 5 that will begin shipping within the next few weeks. The first is an upgraded ClassicDock that is similar to the one announced last week but which adds a second mounting slot to allow users to prop up their devices in either portrait or landscape mode without being mounted on the charging connector. The second is a new iPhone 5 Dock PRO that will be available in both Lightning and micro USB versions, allowing users to choose which type of cable they wish to run from their computer or power adapter to the dock. The dock also includes a removable slot cover to offer two different sizes of docking slots to accommodate both naked and cased iPhones. iPhone5mod has also already announced improved versions of its standard and lightedLightning to USB cables, increasing durability and compatibility. The company also tells us that it is working on several other new docks, including a standalone one for the iPad mini and a universal one for the iPhone and iPad mini, as well as Lightning card readers for the iPhone 5 and iPad mini. Certainly some users have concerns over purchasing unauthorized accessories, and iPhone5mod’s rapid iteration on the already-released cables to improve durability may be a bit disconcerting, but it seems clear that Apple’s decision to keep official accessory manufacturers in the dark until well after the launch of Lightning-based products has left a significant market opportunity for companies looking to meet demand from users. Apple Confirms iTunes 11 Coming In November. Everyone has been wondering when iTunes 11, promised in October, was going to arrive. Apple has now clarified the situation though via a statement to AllThingsD, and it has now been confirmed for before the end of November. The new iTunes is taking longer than expected and we wanted to take a little extra time to get it right. We look forward to releasing this new version of iTunes with its dramatically simpler and cleaner interface and seamless integration with iCloud before the end of November. Whether the timing is coincidental or to do with the management reshuffle is unknown, but it is a very good question. 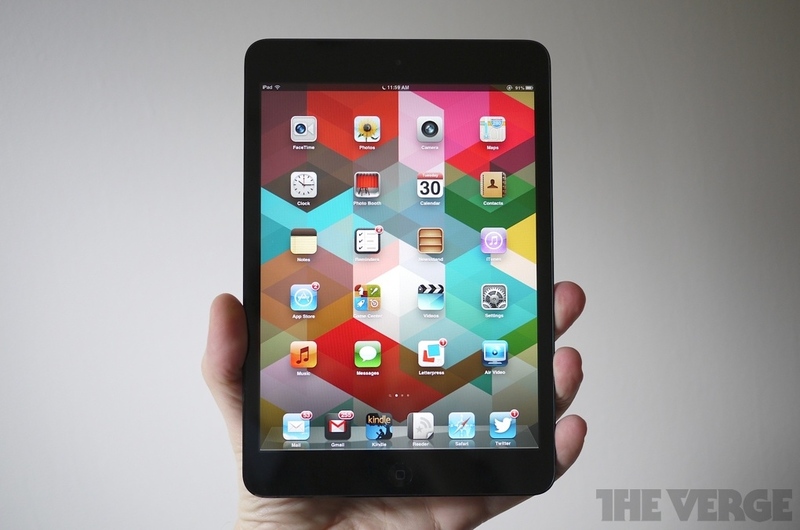 The iPad mini has arrived and so has our review. Just last week, Apple introduced the world to the newest member of its wildly successful tablet line, an adorable, diminutive slate with a 7.9 inch display. It even had an adorable ad to show along with it: an iPad mini joining in with a full-sized iPad to play “Heart and Soul” on the piano. But to think of the iPad mini as a companion to the 3 rd or 4 th generation iPad some kind of secondary player to the bigger version would probably be a mistake. With a price tag starting at $ 329 and heading all the way up to $ 659 (with LTE and 64 GB of storage), this isn’t really a step down from the existing iPad (well, the iPad 2 at least) as much as it is a step to the side. At least, that’s the impression I get. Want a big iPad that isn’t too expensive? Get the 2 nd gen one. Want one that you can throw in a bag or keep on the nightstand? Get the iPad mini. You fly business class and work in photography? Let me point you in the direction of the new 4th generation model. But regardless of market positioning, the iPad mini has to be viewed in a world with a $ 199 Nexus 7 or Kindle Fire HD two strong performers that are a far cry, at least in price, from the iPad mini. Even though Apple might want consumers to see these as separate product categories, consumers may only see that $ 129 gulf. On the other hand, Apple has a lot to fill that gulf, including the absolute best software ecosystem for tablets on the planet right now. 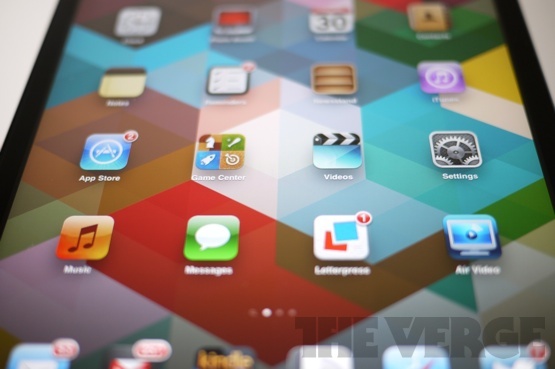 But is the iPad mini worth the stretch, or would you be smarter to save the cash and saddle up to another device? Moments after I held the iPad mini at Apple’s event in San Jose, I hurriedly wrote that it made other tablets in this class feel like toys. Perhaps I was a bit hard on the competition in the heat of the moment, but I will say that there isn’t a single product in the 7 inch tablet market that comes close to the look, feel, or build quality of the new iPad. It is absolutely gorgeous to see, and in your hand has the reassuring solidness of a product that’s built to last. If the iPhone 5 is reminiscent of jewelry, the iPad mini is like a solidly made watch. In fact, the iPhone 5 and the mini have a lot in common. They both share a metal housing (in silver or black) that’s lean and smooth, with that reflective, chamfered edge that runs around the border of the display. The iPad mini’s paint job is similar to the iPhone’s, but smoother, and on the black version I tested has a glint of blue and purple to it in certain light. It looks dangerous, and it feels great. All of the standard iPad button and switch placement is intact here, save for the move of the speaker grille to the bottom of the device (it’s been around back for iPads previous to this version), along with the new Lightning port. And that’s a good sounding set of stereo speakers, by the way. 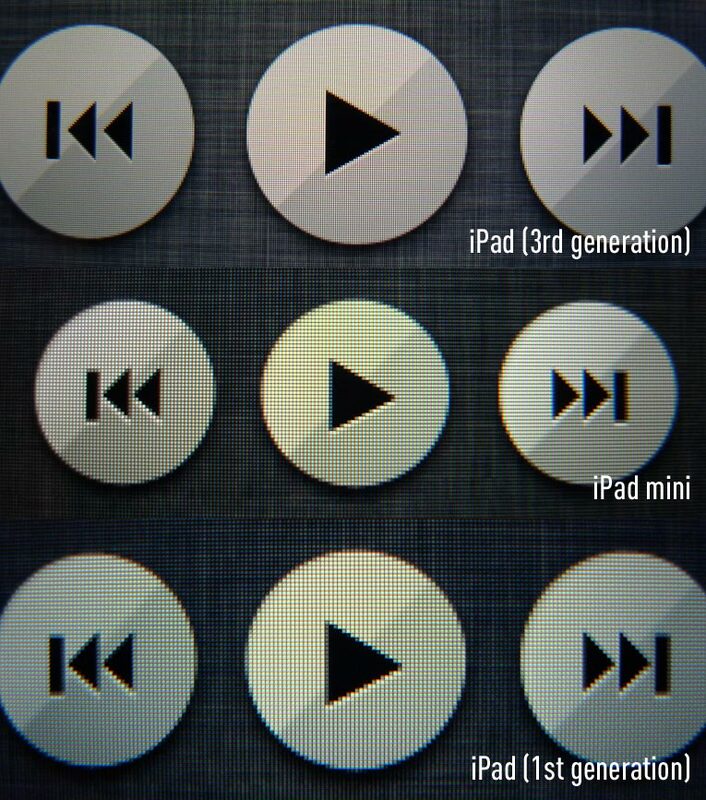 You’ll find separate volume buttons on the right side beneath the mute / rotation lock toggle, and the power / sleep button on the top, just as expected. The front of the device is all glass, save for an HD camera in the center of the top bezel (as you hold it in portrait) and the home button on the bottom. There’s also a 5 megapixel camera on the back. Though the iPad mini sports a slightly larger display than other devices in this class, its profile feels extremely lean. Sometimes too lean. The device weighs just 0.68 pounds, and it’s only 0.28 inches thick noticeably thinner than the Nexus 7’s 0.41 inches or Fire HD’s 0.4 inches. I actually had a little trouble holding onto the device when I wasn’t using the Smart Cover due to the back being as smooth as it is, and the frame being so thin. May be it’s just my big hands, but I wanted a little more to grab onto. In that regard, I prefer the feel of the Nexus 7. That problem was exacerbated by how wide the device feels in your hand, as well as the lack of a significant bezel around the left and right of the screen in portrait. Maybe it’s just old habit, but I did not feel completely comfortable putting my thumb over the screen itself. Apple has apparently included some new palm rejection logic in the iPad mini’s version of iOS which wards off unwanted touches, and it did seem to work. It may have caused other issues, however, which I’ll touch on in the software section. Minor quibbles aside, the iPad mini stands head and shoulders above the competition in terms of design, the caliber of its components, and the solidness of how it’s been built. But it also has another quality, one that’s nearly as important: the device has personality. I’ve started to think of it as a constant companion small enough to throw in a bag or carry around the house. There’s something endearing about the mini that makes you want to keep it on hand and use it often. It’s a feeling the larger iPad never elicited in me. Inside the mini, you’ll find specs essentially identical to the iPad 2, save for a few alterations. The system is built atop the two generations old A5 CPU, appears to sport a dangerously tiny 512MB of RAM, and ships in 16GB, 32GB, and 64GB storage capacities I tested the 64GB, Wi-Fi-only version. All the requisite radios are here too: Wi-Fi 802.11a/b/g/n, 2.4GHz and 5GHz, Bluetooth 4.0, and eventually you’ll be able to buy a version with CDMA, GSM, and LTE cellular options. As you would expect, a light sensor, accelerometer, and gyroscope are here as well. It really is a mini version of the iPad 2, except for the cameras, which are significantly improved. As you may know, I’m not a fan of people taking photos with tablets. Just as with previous models I’ve tested, I find the act to be not only awkward, but embarrassing as well. The slightly more diminutive size of the iPad mini does make the experience slightly better, and its 5 megapixel backside camera is actually not terrible for general shots. In fact, its color tone and low light performance was better than what I’ve seen on many newer smartphones. It was sometimes difficult to get a clean image due to shakiness, but that has more to do with the odd physicality of taking a photo with a tablet than it does with the actual camera. The front facing FaceTime HD camera is fine for video chatting and I think is a lot more comfortable than chatting with the full size iPad, but won’t be useful for anything more than that. Much has been made about the display on the iPad mini. The IPS screen measures 7.9 inches diagonally, and is 1024 x 768 in resolution. For those keeping count, it’s the same resolution as the original iPad. That makes for a pixel density of 163 ppi, which as you might guess doesn’t seem too terrific next to devices like the Nexus 7 or Kindle Fire HD (each 216 ppi), Nook Color HD (243 ppi), or the big daddy 4th generation iPad (264 ppi). It’s also much lower in pixel density than pretty much any smartphone on the market right now. But how does it look? Well for starters, it’s a really good looking display in general terms. Apple is using the same treatment here as it does on the iPhone 5 and iPad, and it makes for a crystal-clear screen that seems to hover just a tiny bit beneath glass. Colors are vibrant and blacks are deep, and games, photos, and video look terrific. That’s only half the story, however. There’s no question that to the naked eye this screen does look lower in resolution than its nearest competition. Pixels are noticeable, especially in webpages, books, and when viewing email and that can be distracting sometimes. Since Apple is the company that’s gotten our eyes used to the hey-look-no-pixels trick of the Retina display, it’s hard to take a step back and not notice. I don’t think the lower resolution is a deal-breaker in this product, but it is a compromise you have to be aware of. It simply doesn’t look as clear as other products on the market. The biggest change in the software on the iPad mini that you need to be aware of is… everything is smaller. 99 out of 100 times while using it, this wasn’t an issue, but it did take some getting used to in places. For instance, because the screen real estate is so much larger than an iPhone but icons are now roughly iPhone size, apps with lots of navigational elements can be a little less intuitive to navigate. Furthermore, the keyboard size feels altered — most notably in portrait — and the keys don’t seem tall enough for my fingers. On the other hand, the mini makes landscape typing a lot easier. Supposedly, the software on the mini has been tweaked to reject unwanted touches on the sides of the display, and during my testing it did seem to keep my thumb from making accidental moves in apps. The flip side to that, however, is that it sometimes seems to overcompensate and reject touches you intended meaning that sometimes apps don’t respond the way you want. It wasn’t a huge problem, but it could be annoying at times, so I hope that Apple makes some effort to fine-tune this in future updates. Other than that, iOS on the iPad mini is exactly the same as the software on a regular iPad. That’s it. The end. Fin. I’m not going to go into great detail about iOS 6 since we’ve already seen it on other products (and in fact have a review of it right here). What I will say is that the fact that is for all intents and purposes a regular iPad makes it easily the most attractive tablet in this size range when it comes to software. It’s easy to become used to how vast and impressive the library is for the iPad, but using the mini reminded me of just how right Apple got this part of their ecosystem. Compared to the Nexus 7 or the Fire HD well, there is no comparison. 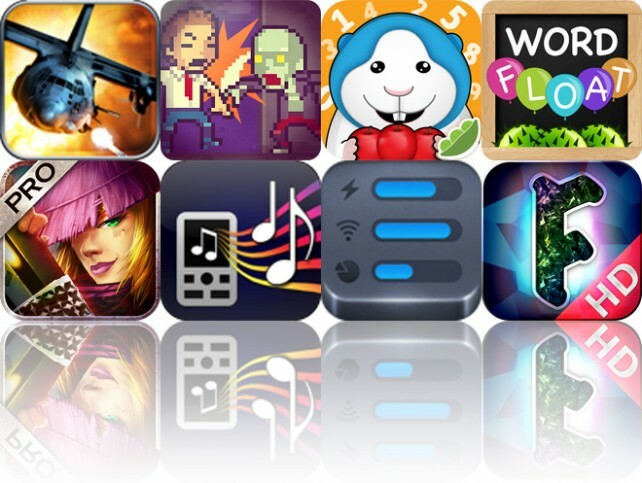 The iPad’s app selection is an embarrassment of riches, and using apps like the powerful Paper or Garage Band, or playing games like the incredibly fun PunchQuest or Letterpress really makes a tremendous case for why a consumer might spend that extra $129. Performance on the device was expectedly snappy. I didn’t see any weirdness, stuttering, or lag that would cause alarm, though some heavier apps and games took noticeably longer to load up than they do on the new 4th generation (or even 3rd generation) iPad. I think for the time being, the mini can handle what developers are throwing at it just fine but I do have my concerns about the shelf life of this product considering how much older its internals are. Given Apple’s habit of rapid-fire obsolescing of products, your timeline for the mini may be shorter than you expect. Battery life was not surprisingly everything Apple claimed it would be. On the tablets more than on any other product the company makes, it seems to be hitting its targets on longevity. I spent some pretty heavy days in mixed use (intermittent sessions of email, web browsing, Twitter, IRC, game playing, music, and video playback), and didn’t have to worry about charging until about the middle or evening the next day. Overall, I was more than satisfied with the iPad mini’s battery performance. 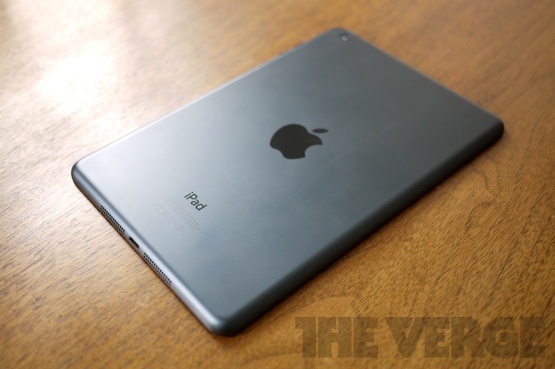 The iPad mini is an excellent tablet but it’s not a very cheap one. Whether that’s by design, or due to market forces beyond Apple’s control, I can’t say for sure. I can’t think of another company that cares as much about how its products are designed and built — or one that knows how to maximize a supply chain as skillfully — so something tells me it’s no accident that this tablet isn’t selling for $ 200. It doesn’t feel like Apple is racing to some lowest-price bottom rather it seems to be trying to raise the floor. And it does raise the floor here. There’s no tablet in this size range that’s as beautifully constructed, works as flawlessly, or has such an incredible software selection. Would I prefer a higher-res display? Certainly. Would I trade it for the app selection or hardware design? For the consistency and smoothness of its software, or reliability of its battery? Absolutely not. And as someone who’s been living with and loving Google’s Nexus 7 tablet for a few months, I don’t say that lightly. The iPad mini hasn’t wrapped up the “cheapest tablet” market by any stretch of the imagination. But the “best small tablet” market? Consider it captured. Today’s A p p s Gone Free: Zombie Building, Zombie Gunship, Bugsy Kindergarten Math And More. Protect the few survivors of the zombie apocalypse by mowing down the ghastly creatures from your gunship in Limbic’s arcade shooter, Zombie Gunship. We also have a casual arcade game with zombies in it, and an educational game that has your child helping a hungry hamster stock up on food. Zombie Building ($1.99 → Free, 6.1 MB): Help civilians escape a zombie invasion by getting them to the rooftop in this casual arcade game. Tap and drag your finger from the elevator to any one of the six floors to move it. The scared civilians will automatically dash into the elevator as long as they aren’t already zombie food. Keep in mind that the elevator can only hold five civilians at a time. Collect the coins that drop on each floor of the building to earn bonus points. The game includes two modes, and leaderboards via Game Center. Zombie Building is available for free for a limited time. It has a 4.5-star rating with a total of 38 ratings. Ringtone Wizard Pro ($0.99 → Free, 2.3 MB): This utility app allows you to create precise ringtones from the music in your library with very little hassle. Songs can be trimmed with 0.1 second accuracy, and they can have durations from one to 40 seconds. You can also add fade to your ringtones, play them back, and export them via iTunes File Sharing or email. Ringtone Wizard Pro is available for free for a limited time. It has a 4.5-star rating with a total of 483 ratings. Zombie Gunship ($0.99 → Free, 29.4 MB): Keep the bunker entrances zombie-free for as long as possible so the few remaining civilians can make their escape in this arcade shooter. Take control of three different plane-mounted weapons and blast all of the zombies from above. The coins you earn during the game can be used to upgrade your armaments and increase your killing efficiency. The game includes four scenarios, multiple objectives to complete, AirPlay support, iCloud support, and leaderboards via Game Center. Zombie Gunship is available for free for a limited time. It has a 4.5-star rating with a total of 64716 ratings. Activity Monitor ($0.99 → Free, 5.8 MB): Keep an eye on your iDevice’s memory usage, storage space, battery level, and wireless traffic with this clean and simple utility app. You can also view detailed info regarding your current iDevice, like processor speed, introduction date, display specifications, dimensions, and weight, or you can look up info for any other iDevice Apple has released. Activity Monitor is available for free for a limited time. It has a 5-star rating with a total of 19 ratings. Final Fury Pro ($2.99 → Free, 149.1 MB): Take on endless waves of alien invaders in this top-down action game. You’re able to guide your character around each arena via an on-screen joystick. Enemies will be targeted automatically, but you can direct your fire if need be by tapping on a unit. You can also unleash powerful skills and unlock new weapons to aid you in your quest. The game includes two characters to choose from, local multiplayer, three maps, and achievements and leaderboards via Game Center. Final Fury Pro is available for free for a limited time. It has a 4.5-star rating with a total of 457 ratings. Bugsy Kindergarten Math ($2.99 → Free, 16.5 MB): An educational game that has your child helping Bugsy the hungry hamster stock up on food by solving math problems. Your child can help Bugsy shop for food at the grocery store by helping him count, add and subtract, spot patterns and relationships, and write quantities. The app adjusts difficult levels based on your child’s skill level and features verbal instructions, so they won’t ever get left behind. The app also includes the ability to track progress, support for multiple profiles, and the ability to email reports. Bugsy Kindergarten Math is available for free today only (10/30). It has a 4.5-star rating with a total of 44 ratings. WordFloat ($0.99 → Free, 39.8 MB): Keep lettered balloons afloat by creating valid words from them in this fast-paced word game. Lettered balloons rise to the top of the screen at the beginning of the game. Tap on balloons to create words from their letters, which will also keep them up in the air. If a balloon goes unused for too long, it will begin to descend upon cactus spines at the bottom. Once all of the balloons pop, it’s game over. The game includes three difficulty levels, a large word database, and local leaderboards. WordFloat is available for free for a limited time. It has a 5-star rating with a total of 6 ratings. Fluke HD ($0.99 → Free, 10.9 MB): A colorful board game that borrows gameplay elements from classics like Snakes & Ladders, Sorry!, and Ludo. The concept of the game is to get all four of your tokens from the starting point to the finish line before any of your opponents do. 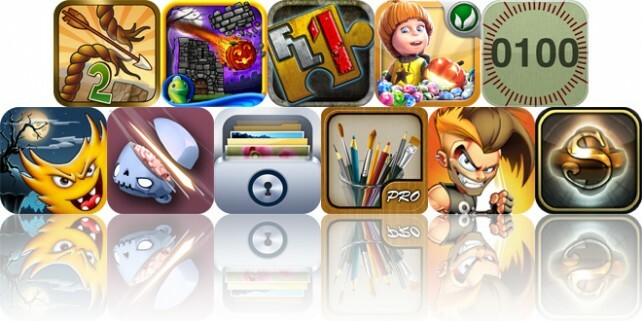 It features the ability to play with up to six players on the same device, or you can take your skills online via Game Center. It also includes five board types, and achievements and leaderboards via Game Center. Fluke HD is available for free for a limited time. It has a 4-star rating with a total of 201 ratings.